What is the problem? : Our way of living is generating unprecedented levels of greenhouse gases that trap heat coming from the sun, thus increasing atmospheric temperature. This warming enhances soil water evaporation resulting in drought and heatwaves in normally dry places or massive rain and floods in commonly wet areas. In the oceans, warmer waters evaporate faster leading to much stronger hurricanes, while ice melting and water heat expansion is raising sea levels. There are many hits into the consequences of a changing climate. In the USA alone, there are examples of people running out of water in California; people dying from heatwaves in New York; people losing their homes and livelihoods to hurricanes in Texas, Florida and Puerto Rico; floods damaging homes and crops in Texas and Hawaii; drought impacting farmers in California and the mid-west; roads and houses lost to rising sea levels in Florida, and Hawaii, etc. The problem is so massive that leaders from 195 countries signed The Paris Agreement to reduce climate change. Unfortunately, the current timelines for solutions are too slow for the fast pace of climate change. In the state of Hawaiʻi, for instance, 2045 was set as the year to achieve 100% clean energy; yet our own studies at the University of Hawaiʻi suggest that unprecedented climatic changes will be common in the state by the 2030s. What is the solution? : The ultimate solution to climate change is carbon neutrality: when our CO2 emissions are equal to the emissions removed. Our project, The Carbon Neutrality Challenge, will offer such an opportunity by generating a mechanism for people like you or me to become Carbon Neutral, and having fun along the way. The premise is to calculate how much CO2 you generate, estimate the number of trees necessary to sequester those emissions, plant the trees, and then climate change solved! (Note: via photosynthesis, trees turn CO2 into biomass). Increasing awareness about the difficulty of keeping emissions in check could also generate new social norms desperately needed to avert the pace of climate change, while indirectly, helping to restore ecosystems. What have we done so far? : We already started!. We want to make Hawaii the first Carbon Neutral place in the world and make history as the first place where climate change got started to be fixed for real. For the last three years, we have been running several pilot studies to assess the feasibility of making people carbon neutral by means of planting trees. We have reached over 1000 people and planted several hundreds of trees. This, however, has been done at small scale to test the challenges of such a project. We found several challenges that we have worked to overcome. For instance, there is high tree mortality due to lack of water and weeds, and we developed several devices that avoid these problems. Transplanting is also a cause of mortality as roots get damage when moved from pots; after a few tests we found non-woven bags that are remarkably cheaper and allow direct planting without ever touching the seedling roots. What is next? : Our current difficulty is how to get people excited or motivated about planting trees at large enough numbers for it to actually make a difference. In this regard, we want to do a social experiment for people to compete for the record of the most trees planted in one day. Basically, groups of people come together, plant trees, and their cumulative planted trees get ranked in comparison to the trees planted by other teams. Competitions are open at all times so users can go back to plant trees and beat their own record or that of others. Behaviorally, this plays into the human motivation for competition and from an environmental perspective it could result in potentially thousands or millions of trees planted. How this project came to be? : The original idea of the Carbon Neutrality Challenge came about here years ago from my seven year old daughter, Asryelle Mora Rollo, who suggested that should make a competition for people to become carbon neutral. She was also the brain behind the second innovation of the project, which was to create races for planting trees. She noted that in her school children were actually excited about reading, because they were part of a project in which they were ranked by the person that read the most articles and read them well. She then inferred that we could make people race to plant trees, and that the motivation for racing could generate the interest we needed for people to come and put the trees in the ground. Ever since, she has been spoke person for the project, having presented the project at NGOs, Schools and companies. Who are we? 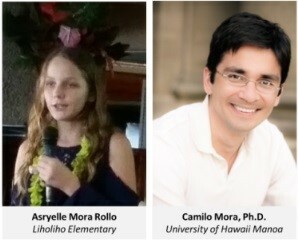 : The project is led by Camilo Mora, Ph.D. who is an Associate Professor at the University of Hawai‘i at Mānoa. His work on climate change has been showcased in The New York Times, The Washington Post, Newsweek, Time, Fortune, CNN, and even conservative channels such as Fox News and Breitbart, among many others. He is the author of over 65 scientific publications, three of which have been among the top 100 science stories in the world in 2017, 2013, and 2011. He is among one of Hawai‘i’s top 20 people to watch for the next 20 years according to Hawai‘i Business Magazine. The team also includes Asryelle Mora Rollo, who as an 11 year old woman has taken on the job of showcasing the project to NGOs and schools; and Audrey Rollo who is in charge of operations. The Outdoors Circle and Myles Ritchie have help with operations and contributed to secure planting sites and helped with their clearing. We have counted on the support of The Garden Club of Honolulu to develop our web-page, and on many of their members, particularly Barbara Kuljis, Lori Eldridge, Margaret Mortz and Paulette Stone, as well as Roxanne Adams from UH, to propagate native tree species. The Lyon Arboretum and Foster Botanical Garden, represented by Talia Portner, and DLNR represented by Laura Chapman, have supplied seeds. Ryan Peralta from DLNR, State Parks, private land owners, John-Carl Watson, Rebecca Beralas, and Will Weaver from the Koolau Montains Watershed Partnership and Pauline Sato from the Malama Learning Center have facilitated planting sites.